Working toward making cardiac care safer and less invasive for patients around the world, Rady Children’s has established the Dickinson Family Image-Guided Intervention Center under the direction of Kanishka Ratnayaka, MD. Experts at Rady Children’s already have started ground-breaking work performing the world’s first-in-human non-surgical connection of two large blood vessels in a patient with congenital heart disease. Thanks to The Donald C. & Elizabeth M. Dickinson Foundation’s $2 million lead gift, this center will be the nation’s first pediatric image-guided intervention center of excellence, utilizing non-invasive radiation-free magnetic resonance imaging to diagnose and treat heart disease. This technology more safely and efficiently reduces risk, improves interventions and effectively transforms cardiovascular care in pediatric patients. Real-time cardiac MRI also addresses the two main limitations of conventional imaging and image guidance by providing better visualization of 3-D structural relationships and minimizing radiation exposure. Interventional cardiac catheterization is one of the underappreciated heroes of modern medicine. Guided by X-ray images, cardiologists take a catheter and snake it up through a blood vessel toward the heart, opening up narrowed vessels and enabling them to replace a valve, stitch up a hole in the heart or repair a variety of other issues. Catheterization has become a cardiovascular workhorse, particularly for children with congenital heart defects. The alternative would be open-heart surgery, which is quite effective but also adds a number of risks, as the ribs must be separated for surgeons to access the heart. Catheterization is minimally invasive and a particularly good option for sick children. At Rady Children’s Hospital-San Diego, nearly 100 children per year undergo a catheterization procedure to treat an abnormality that would have required cardiac surgery as recently as five years ago. But there’s a challenge. To navigate the catheter through the body, cardiologists must rely on fluoroscopy, which is like an x-ray movie. The images aren’t great, and patients get small doses of radiation during each procedure, which can potentially have long-term consequences. “Kids have growing and developing tissues, so they are particularly radiosensitive,” says Kanishka Ratnayaka, MD, an interventional pediatric cardiologist at Rady Children’s. 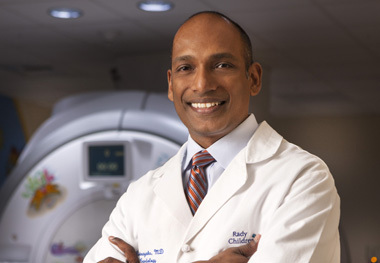 Dr. Ratnayaka, who recently came to the Hospital from Children’s National Health System in Washington, DC, has spent many years working on an alternative to fluoroscopy: real-time cardiac MRI. This emerging technology produces no radiation, provides clearer pictures and could revolutionize how catheterization procedures are performed. Dr. Ratnayaka grew up in Athens, Ga. and thought he would return home and be a small-town pediatrician. But during his pediatric residency at Children’s National, he discovered how much he enjoyed pediatric interventional cardiology. He found his niche caring for kids at Children’s National and conducting interventional cardiac MRI research at the National Institutes of Health (NIH), just up the road in Bethesda, Md. In the joint NIH/Children’s National program, physicians were determined to bring real-time, cutting-edge cardiac MRI to kids. In April 2013 they succeeded, as Dr. Ratnayaka and his colleagues opened one of the world’s first interventional cardiac MRI suites at Children’s National. He was an emerging star in cardiology, and the leadership at Rady Children’s took notice, making it their priority to bring Dr. Ratnayaka to San Diego. They wanted him to replicate his Washington success and build upon it in San Diego by establishing an interventional cardiac MRI center at Rady Children’s. It was a great opportunity for everyone. San Diego had a number of other advantages. Dr. Ratnayaka was impressed by the wealth of biomedical research talent in the region. He notes that UC San Diego is the no. 2 biomedical engineering school in the country, and he’d already collaborated with researchers there. “I saw an opportunity to build something special,” he says. If eliminating radiation from catheterization procedures were the only advantage of interventional cardiac MRI over fluoroscopy, that would be enough incentive to build the Image-Guided Intervention Center at Rady Children’s. Performing one procedure might not be a big deal, but sometimes cardiologists have to go in several times to repair a more complex congenital defect or ensure the body is not rejecting a transplanted heart. That advantage extends to the clinicians who work in the catheterization lab: cardiologists, anesthesiologists, nurses, technicians. They’re in there every day, often for more than one session. But beyond safety, cardiac MRIs have another important distinction: The images are much clearer and can be rendered in three dimensions, giving clinicians a better view of the patient’s anatomy. This superior ability to image anatomical structures can help cardiologists better recognize where they are inside the body, adding that extra margin of safety. Equally important, it may give them opportunities to reduce how much surgical intervention is required. As is often the case, enormous leaps like real time cardiac MRI take a long time to roll out. Many of the tools that work with X-rays are incompatible with MRI. Dr. Ratnayaka has spent more than a decade optimizing procedures and developing new tools that support cardiac MRI. In some cases, he and his team were able to modify off-the-shelf devices to solve a problem. In others, new approaches had to be developed. MRI-safe metallic and polymer guidewires, for example, are currently undergoing clinical testing. When he got to San Diego, Dr. Ratnayaka hit the ground running to set up the nation’s first Image-Guided Intervention Center for children, which will focus on children with cardiac disease, and help those with other conditions as well. The effort received a big boost from the The Donald C. & Elizabeth M. Dickinson Foundation, which made a $2 million gift. Learn more about the first-in-human non-surgical connection of two large blood vessels.